I owe an apology to Peanut Butter Lover’s Anonymous. I tote my devotion to the sticky, gooey, creamy spread of lovin’ all the time; however, peanut butter has been surprisingly absent from Fooduzzi since its inception. I am a horrible member of this organization. Please excuse my ignorance. I was, am, and always will be a peanut butter fiend. My faithfulness to this nut butter ran deep as a child: PB Cap’n Crunch was my go-to breakfast, I was convinced that Reese’s eggs were gifts sent from the gods, and chewy no-bake cookies were my most-requested road trip food when we stopped at Sheetz. …it’s a Pittsburgh thing. Now? The ingredients in all of those treats make me cringe. Refined sugar, unneeded fats, and unpronounceable ingredients? No thank you. I don’t have much of a sweet tooth anymore, but after perusing through all of those Pi Day pies and St. Paddy’s Day treats posted earlier this week, the young peanut butter-chocolate-crazed kid in me started to rear her ugly head. While it isn’t quite the time of year for Reese’s eggs (yet…stay tuned), I figured that it’s always no-bake cookie time. 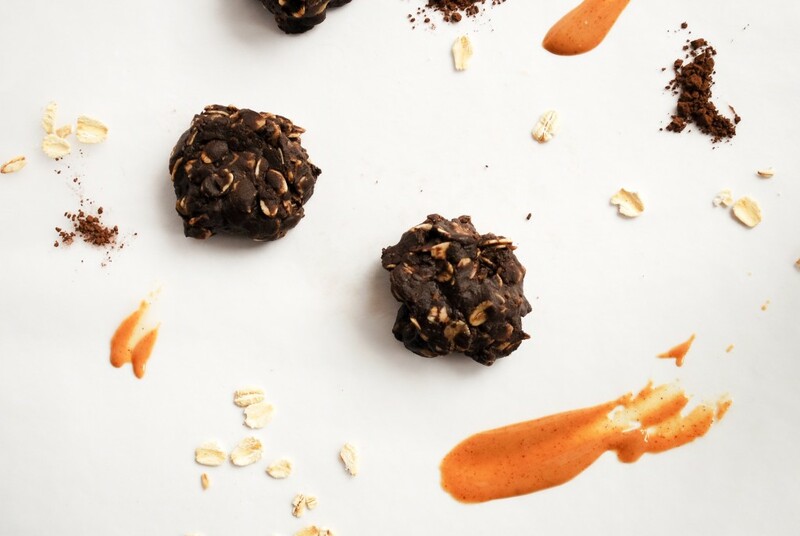 Filled with satiating healthy fats and whole foods, you can indulge in these naturally gluten free and vegan Whole Food No-Bake Cookies any time. If there was an Oat Lover’s Anonymous group, I would totally join that, too. Rolled oats are one of my favorite foods. They’re filling (hello, fiber). They’re healthy (how you doin’, 6 grams of protein per 1/2 cup?). And they’re gosh-darn delicious. Once I saw that you could add oats to cookies, I was totally sold. Oats are the only grain structure we’re adding to these cookies, so these no-bakes are naturally gluten free! I like the taste and texture of rolled oats in my no-bakes, but I’d bet that you could use quick oats if you’re not so akin to the consistency. To our oats, we need a creamy base. A little coconut oil (for structure and healthy fats), some maple syrup (for some natural sweetness), a bit of cocoa powder (for…chocolate), and a touch of salt (for flavor balance) are added to the king of all nut-butters: peanut butter. We measure these ingredients. We add them to a pot. We melt them down. We stir. Done. No-bake cookies are supposed to take no time at all. They’re what you make when you NEEDACOOKIENOW and don’t want to wait for the oven to work its magic. With these simple, whole food ingredients, you may not need your oven for cookies ever again! Well. Maybe. Oh, guys. These cookies take me back. 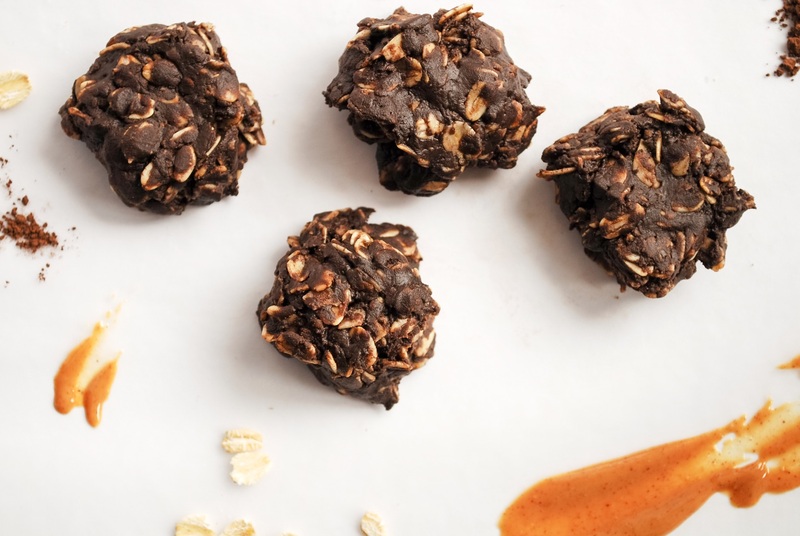 That five-year-old Alexa in me is so stoked to be indulging in this healthy no-bake treat! 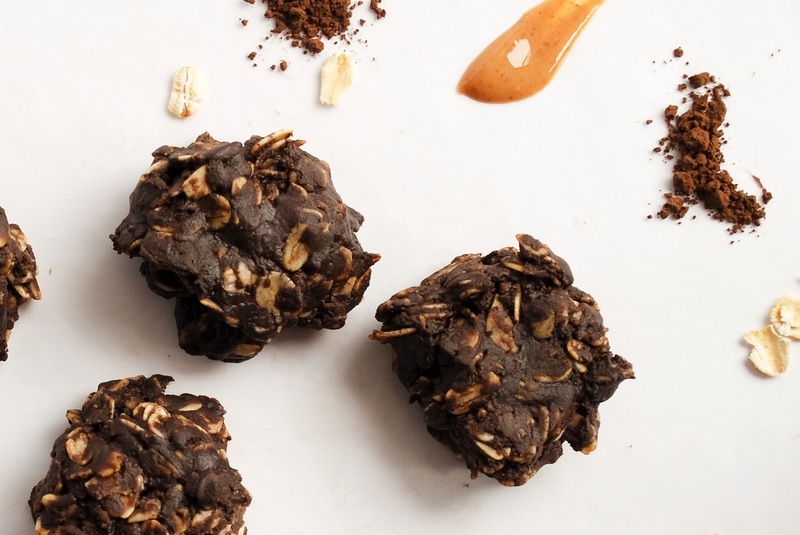 Not only are these Whole Food No-Bake Cookies packed with the flavors of the perfect dynamic duo – peanut butter and chocolate -, but they’re filled with good-for-you, nutritious ingredients. Make these soon! Your inner child will profusely thank you. These cookies were a childhood favorite of mine, but with this five-ingredient, whole food remake, I can enjoy these gluten free and vegan treats any time! In a small pot over medium heat, melt coconut oil, maple syrup, peanut butter, cocoa, and salt until one it is one cohesive liquid. Mix to combine. Remove from heat, and add rolled oats. Stir to coat well. Taste (carefully - the mixture is hot!) and adjust sweetness if needed. If your mixture is too dry, feel free to add more melted peanut butter or coconut oil. If the mixture is too wet, add more oats. Carefully form into cookies (I got about 8), and set on a plate in the fridge to set for a couple of hours. Store cookies in the fridge. *I used creamy peanut butter, but feel free to use crunchy for even more texture. Other nut butters should work, although I didn't try it out. Also, my peanut butter was very drippy. I can't imagine that would make too much of a difference, but it's definitely worth noting! **Omit the cocoa for the best Peanut Butter Whole Food No-Bake Cookies of your life! If you do, you may need to add an extra Tbsp. of oats or so. ***Quick oats would probably work for a less oaty texture.